Have any of you heard of the app called Digit? I was hesitant to participate in this savings plan, just because I thought it sounded too good to be true, however after numerous articles came out about it, I decided to give it a try. You can read all about it here, here, here, here, here, here, and here. 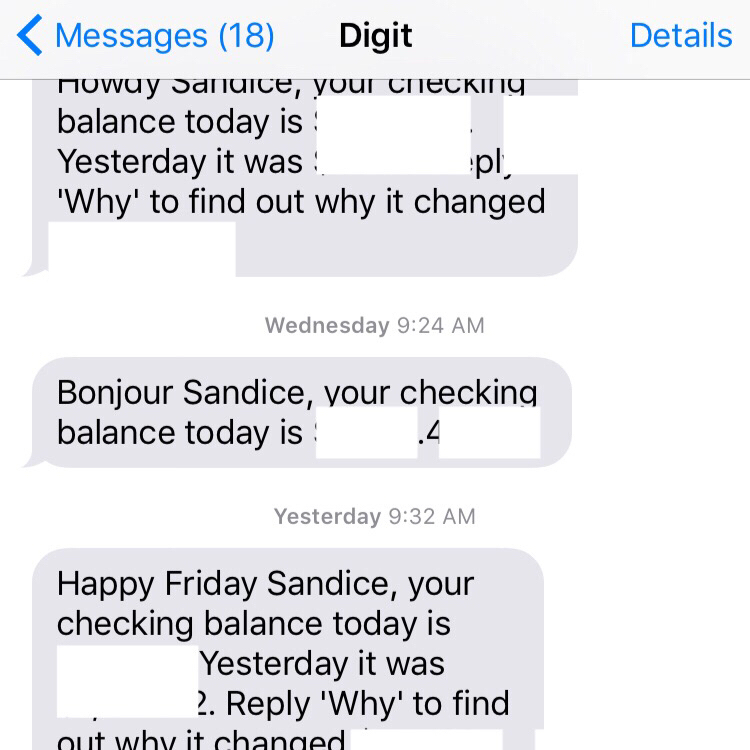 To use Digit, you need to connect your checking account. This allows Digit to analyze your income and spending, and find small amounts of money it can safely set aside for you. They use 128-bit bank-level security, and don't store your bank login. Every 2 or 3 days, Digit transfers some money (usually $5-50) from your checking account to your Digit savings and they never transfer more than you can afford, so you don't have to worry about over-drafting your account. In fact, they have a no-overdraft guarantee. When you need your savings, send Digit a text message. Digit will transfer the money from your Digit savings back to your checking account next business day. Digit allows unlimited transfers, with no minimums, and no fees. Happy Friday! Now go check out the Digit app! *pinching myself* am I dreaming? Sweet Stuff Sunday: GF Sour Cream Coffee Cake!